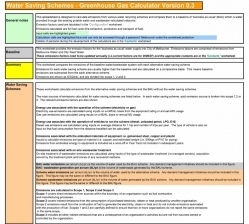 This spreadsheet is designed to calculate emissions from various water recycling schemes and compare them to baseline of 'business as usual' (BAU) which is water provided through the existing potable water and wastewater reticulated networks. This worksheet provides the emission factors for the 'business as usual' water supply into City of Melbourne. Emissions factors are comprised of emissions from Melbourne Water and City West Water. We welcome your feedback and results from using the carbon calculator so that we can sure it operates as well as can be.